It feels like forever since I blogged, but here I am back again! I've had such a rubbish weekend. I've been so tired, and achey my wee muscles feel like I've been beat up.So I've been in a bit of a blue mood, I also had a killer hangover today from too much wine and not enough dinner. So you could say my Sunday left a lot to be desired. We headed into town to get a little bit of dinner, the thought process that a little grease would kill the hangover. So I decided to wander through the beauty, fragrance, handbag, jewellery and shoe floor in House of Fraser. It is by far my favourite floor, and there's a Nails Inc and Paperchase for good measure, so I made my way through it in an attempt to cheer my sorry self up. I had a swatch at the Benefit counter, sniffed Chloe handbags and had a good smell of the new Balenciaga fragrance (it is rather nice if you were wondering). We rounded the counter and I spied my absolute favourite fragrance Bottega Veneta. For those of you unfamiliar with Bottega Veneta, they're a gorgeous (expensive) bag designer. I'd been putting off buying it because it is just so expensive, so I had my usual (very) liberal squirt of the tester and proceeded to the other new Christmas sets. Himself then informs me that he's buying me it to cheer me up. I of course protest (weakly) that it's too expensive, but he's already got it in his hand and is heading to the tills. 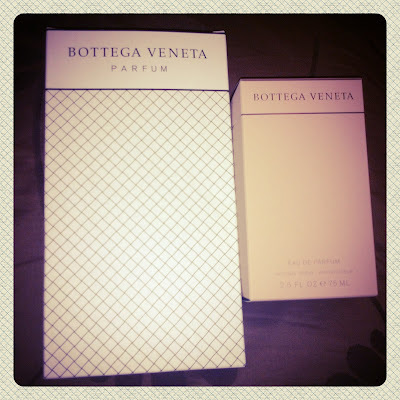 What I didn't realise was that with the 75ml EDP you get a rather lovely free make up bag with Bottega Veneta leather trim and leather mirror set. 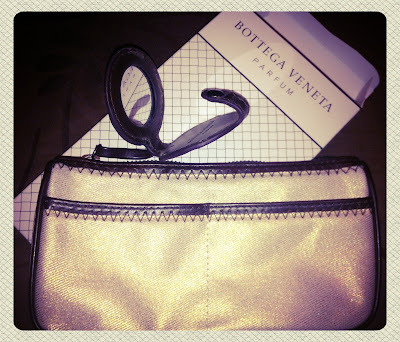 Here's my little free make up bag, the girls also gave me heaps of samples of Bottega Veneta for my bag, wasn't that lovely of them. As an ex perfumery worker I know how busy it can get and how cagey you have to be with samples from time to time so I really appreciated the little samples. I know what it is like to be constantly asked for samples. When I worked for Clarins we would get a daily stream of people coming in for samples, we'd get a stock of samples sometimes to last a month or more and they had to be given to customers, we often used them to add to baskets which customers had ordered. They bulked out two or three products and made it look lovely. We'd give them to people buying other products, and as far as possible we would try to give samples to those genuinely wanting to try things. The problem was we would get the same people coming in once or twice a week never having bought anything but wanting a sample of the same thing. Then you become the bad guy because you have a duty to your other customers to make sure they also can get samples so you have to say 'no we don't have any of those left'. I once had the occasion where I said 'no we don't have any of that foundation colour left' and had the customer come round to my side of the counter and start rooting through my sample boxes for it herself. That's the point where I had to say, 'I'm really sorry but this is inappropriate, I'm happy to sell you a bottle but we have no samples of it'. Yes it made me out to be a total horrible person but they're samples so you can try it at home see if you like it then if you do, buy it. Not so you never have to actually buy it. So I really appreciated being given a few samples as I never ask for them. Gosh wasn't that a rant, back on topic. 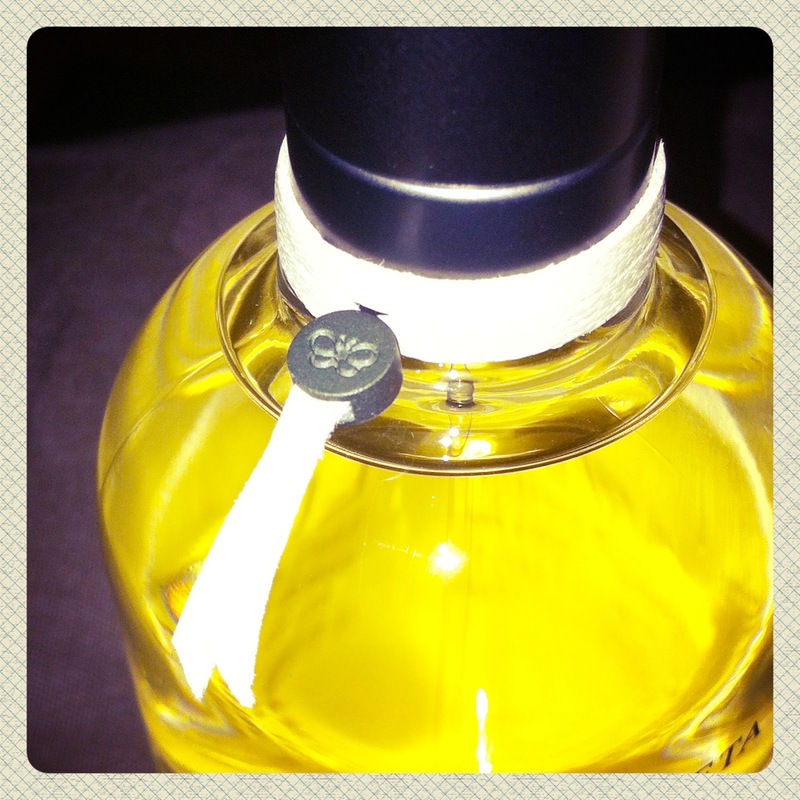 Round the bottle comes a little leather collar.Obviously from the Bottega Veneta leather and the little butterfly logo. It's a very understated packaging. So what does it smell like? Well some people have described it as a unisex fragrance, I think the fact this and the Halle Berry Closer bear strong resemblance to a lot of male fragrances goes some of a way to explaining why I like them. 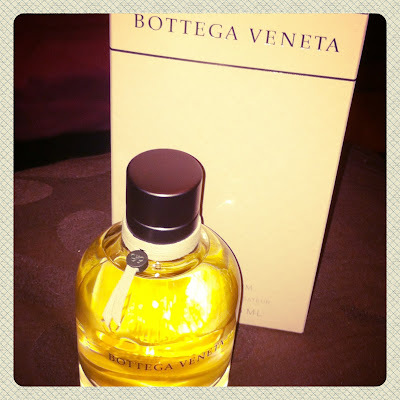 I've put the Bottega Veneta on himself and it smells totally different than it does on me; much richer and spicier, on me it is softer and you can smell the moss more. It is often sold in men's sections as well as female so it is able to be worn by both. The top notes are bergamot (my favourite) and pink pepper, the middle notes are jasmine and the base is oak moss and patchouli. How do I describe it? Well I see it as spicy, but soft it has a very unusual scent and it does smell of freshness and warmth at the same time. Himself has told me it makes him want to reduce in size and live on my neck when I wear it which I take as a good sign. 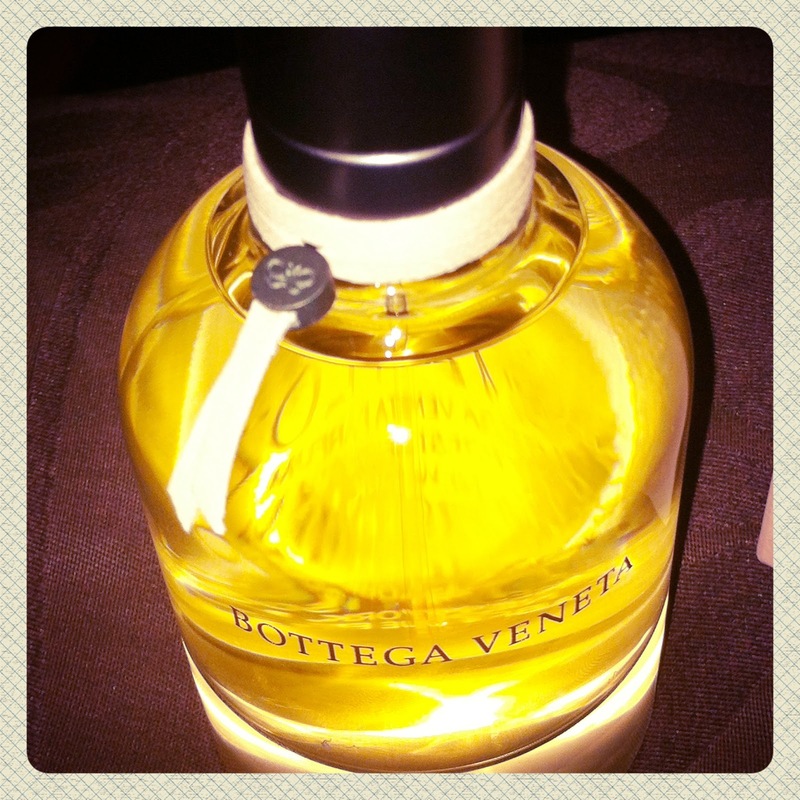 It is just the yummiest, I would strongly encourage you to go and give it a sniff as it is my total favourite. It also totally cheered me up any of my friends who read this blog feel free to sniff me when I see you and see what you think!